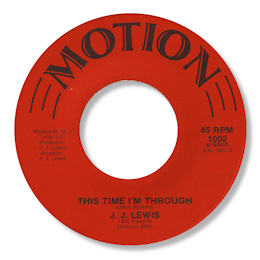 Mississippi vocalist J J Lewis only had but two 45s released under his name – a pity as his rich deep gruff tones are a real pleasure to listen to. His first single Mississippi Cotton Fields is a heartfelt social commentary on Afro-American life in the Delta, illuminated by some fine blue licks from the lead guitarist. This appeared on the tiny Motion label, who’s only other release I know came from the excellent Bill Sampson. 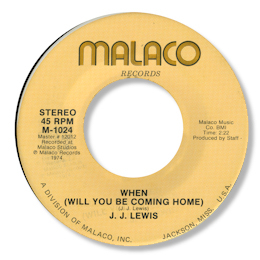 His second release for Malaco is even better, as When (Will You Be Coming Home has an insidiously strong melody and some tasty wailing from Mr Lewis. Despite what it says on the label, this certainly doesn’t sound like a typical Malaco track from the period – to me it sounds much more like the Motion 45 and may well have been recorded at the same session as his initial 45, and then leased out to the Jackson based company. "Just listened to "Mississippi Cotton Fields" by J.J. Lewis. Wow! I had almost forgotten what a great, great 45 that is. And I'm stunned to rediscover it, nearly four decades later, from someone thousands of miles away in another land. I had always assumed it to be some impossibly obscure record that disappeared without a trace soon after a few dozen copies were pressed. ... I was living in Jackson when I heard a brief interview with Lewis on one of the soul stations there, back when someone could walk into a radio station with a record and get it played (at least once). I'm fairly certain this would have been in the summer of 1974, when I first moved to Jackson. I probably bought it the next day at a five and dime on Capitol while walking home from work. After all these years, I can't recall much of the interview. However, I'm fairly sure Lewis told the DJ that he really did come from the Delta, just as the song says, and that he did not play the sizzling blues guitar heard throughout. (He probably also named his hometown and the guitarist, but those details are irretrievably lost in the dim recesses of my fading brain cells.) As the record trails out, Lewis shouts "call my number ... 67983. Which, I recall he told the DJ really was his number. Too bad it's only a partial number. And the 1420 Everett address on the label produces only a stickpin on Shirley Avenue when I try to find it on Google maps. Maybe Everett was swallowed up by the Jackson State University campus in the intervening years." Thanks to my great friend Greg Burgess for the suggestion and to Jeff Kuhn for his memories. Maybe JJ or a member of his family will get in contact. I hope so.